Adobe's Digital Index team on Thursday issued a report on video viewing and browsing ahead of Apple's WWDC, noting that Apple TV has doubled its share in premium video viewing to overtake Roku as iOS devices in general widen their lead over Android and other competitors. Based on stats the group called "the most comprehensive report of its kind," examining 200 billion online video plays, 2.85 billion "TV Anywhere" authenticated video streams and 500 billion website visits, Adobe has detailed that Apple TV "doubled its share of premium video viewing in just one quarter from 5% in Q4 '14 to 10% in Q1 '15 - overtaking Roku." 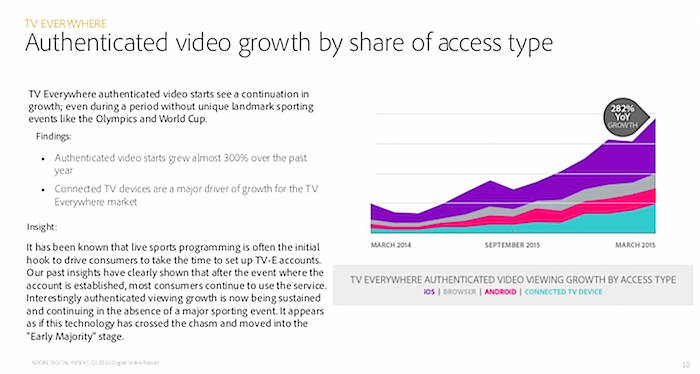 Additionally, iOS on mobile devices has increased its share of premium video views to now account for 47 percent, while desktop and mobile browser-based video has sank "to a new low" at 14 percent, while Android devices remained flat at 15 percent, less than a third of the video pie slice claimed by Apple's platform. Among unauthenticated video views, Adobe said that Apple's iOS is even larger, claiming a dominant 82 percent share of that market segment. 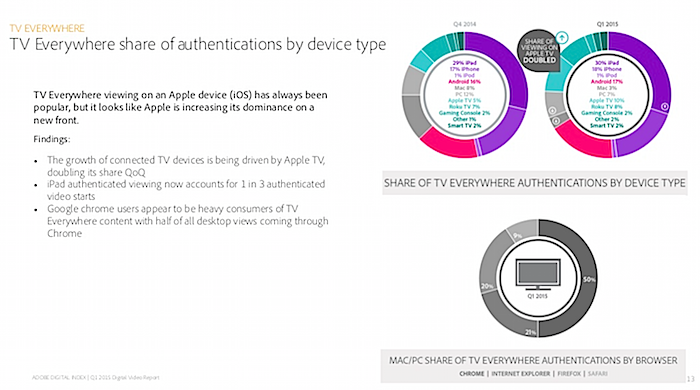 Additionally, Adobe stated that Apple devices "currently drive 62 percent of all authenticated pay-for-TV video views." "Apple is sitting in the catbird seat because of its dominant position with access to consumers and a wealth of video data," stated Tamara Gaffney a principal analyst at ADI. "The challenge will be to see if it can monetize the strategy fast enough to get ahead of the movement away from linear TV toward digital viewing. Apple is clearly looking to play in the video-streaming market, and the growth of that market is a big indicator as to why." "Everywhere TV," including on-demand video services such as Netflix, Hulu and HBO Go and over 300 related sites and apps, "has dramatically shifted trends in TV programming consumption--impacting ad-buying strategies as a result," the group noted. Apple TV and iOS, particularly on iPad, have pioneered and embraced the business model of Everywhere TV, and Apple has capitalized on the demand for flexible, user-driven mobile video by offering a premium mobile hardware experience and regularly enhancing its products for consumers with constant, incremental updates. Apple's Everywhere TV share grew from 60 percent of the market one year ago to 62 percent, with growth among Apple TV users doubling while video plays on Macs decreased. Apple's share growth increased even as the overall market grew substantially, by 282 percent. 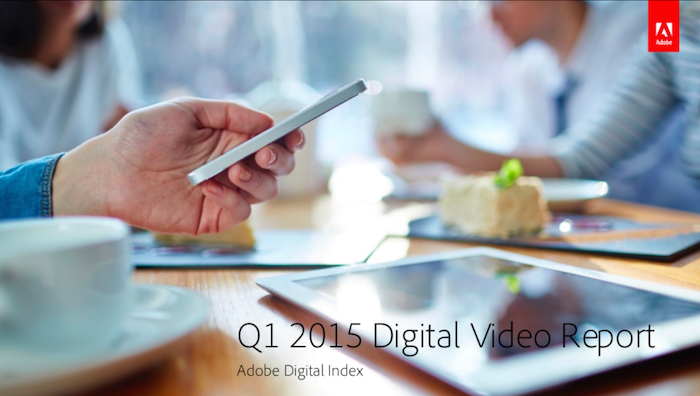 Adobe reported year over year growth for Q1 benefitting iOS and connected TV devices including Apple TV, while browser growth (dominated by Google's Chrome) remained nearly flat and video viewing on Android actually decreased, enabling iOS to surpass the larger installed base of devices making some use of Google's mobile software. 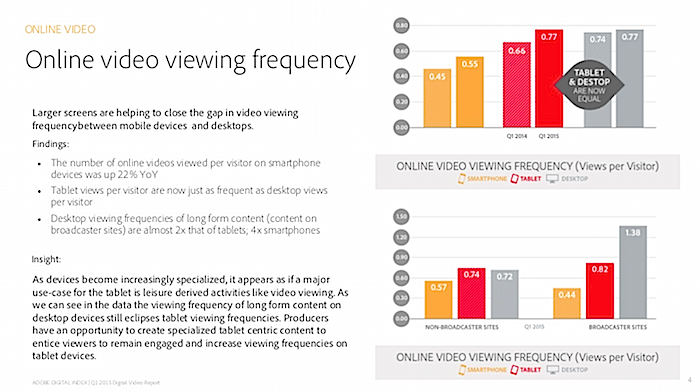 Specific to mobile devices, Adobe reports that "online video viewing on mobile devices is being dominated by Apple. 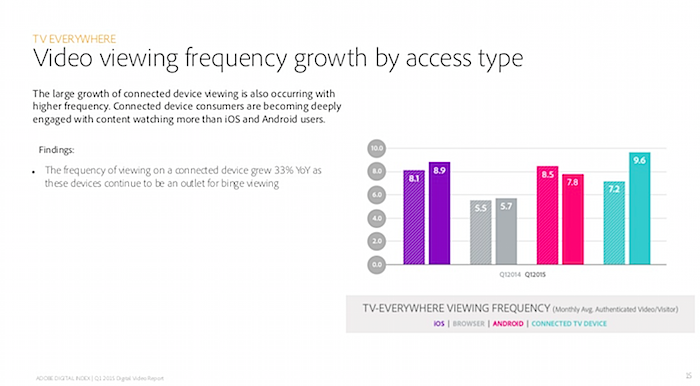 The introduction of iPhone 6 and 6+ has only escalated the growth that Apple has seen within online video viewing." 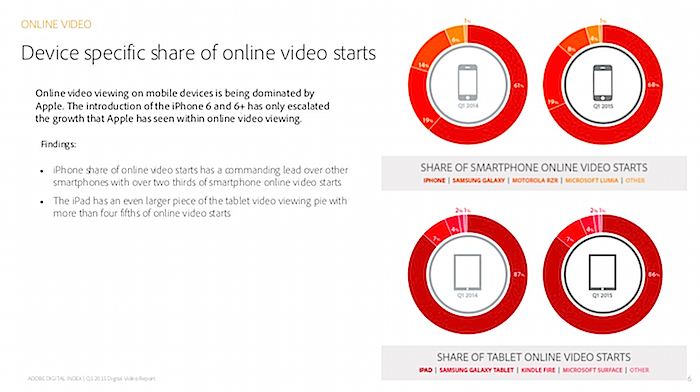 The group further noted that "iPhone share of online video starts has a commanding lead over other smartphones with over two thirds of smartphone online video starts," and that iPad has an even larger piece of the tablet video viewing pie with more than four fifths of online video starts." However, Adobe also noted that outside of smartphones and tablets, set top boxes like Apple TV acting as a "connected device" are increasingly driving consumers into "becoming deeply engaged with content watching more than iOS and Android users," a trend that appears to underly Apple's strategy in fleshing out its Apple TV offerings. Apple has been rumored to be working on an enhanced Apple TV and a new subscription TV service bundle, although recent reports have suggested that the company won't be introducing new TV-oriented products or initiatives as its developer-centric WWDC week long conclave scheduled to kick off in San Francisco next week.